The smart cruise control system allows you to program the vehicle to maintain constant speed and distance detecting the vehicle ahead without depressing the accelerator or brake pedal. For your safety, please read the owner's manual before using the smart cruise control system. To activate smart cruise control, depress the brake pedal at least once after turning the engine start/stop button switch to the ON position or starting the engine. This is to check if the brake switch which is important part to cancel smart cruise control is in normal condition. If the smart cruise control is left on, (cruise indicator in the instrument cluster illuminated) the smart cruise control can be activated unintentionally. Keep the smart cruise control system off (cruise indicator turn off) when the smart cruise control is not used. Use the smart cruise control system only when traveling on open highways in good weather. Do not use the smart cruise control when it may not be safe to keep the car at a constant speed. For instance. - The sensing ability decreases if the level of front and rear vehicle is changed from the factory. 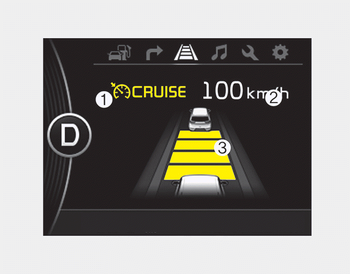 Pay particular attention to the driving conditions whenever using the smart cruise control system. The smart cruise control system is not a substitute for safe driving. It is the responsibility of the driver to always check the speed and distance of the vehicle ahead. Be careful when driving downhill using the SCC.